On a list of unpleasant activities for dogs and cats alike, bathing surely rises to the top. Many cats and dogs exhibit tremendous anxiety at bath time, whether due to fear of water or the dislike of restraint. Dry bathing avoids much of the anxiety associated with bath time and can produce terrific results. Many pet retailers offer dry shampoos for both cats and dogs, but it's just as easy to make your own. Combine the baking soda and cornstarch in a bowl. Whisk thoroughly. Baking soda is known for its odor removing properties, and cornstarch is a soothing conditioner. Remove the lid from the mason jar and place it on a flat surface. Using the Phillips head screwdriver and hammer, pound several holes into the lid. You'll be making a shaker for your shampoo mix. Scoop the dry shampoo mix into the mason jar and secure the top. Choose a space to dry bathe your cat or dog. An enclosed area works well, such as a bathroom. In warmer weather, you may want to bathe your dog or cat outdoors. Brush your pet thoroughly using a stiff brush. This removes excess hair and debris from the fur. Shake a small amount of the mixture onto a small area of your pet. A 3- to 4-inch circular area is fine to start. Test the mixture to make sure your pet doesn't have a reaction. Work the mixture into your pet's fur using the soft brush or your fingers in a circular motion. 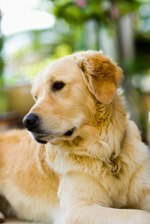 The mixture will adhere to dirt and oils in your pet's fur. Continue this until all areas of your pet's fur have been treated. Allow the mixture to set for 20 minutes. For deeply soiled or stinky fur, leave the mixture on for 50 minutes. Brush your pet thoroughly to remove mixture.